Nyonya dessert that is very easy to make - Sweet Potato in Ginger Syrup. 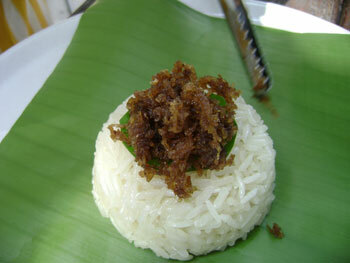 This is a very simple Nyonya dessert or tea treat. It is light, and cooling. The dessert uses ingredients easily and cheaply available in this region: pandanus leaves, old ginger, sugar (brown, white or rock sugar) and of course sweet potatoes. 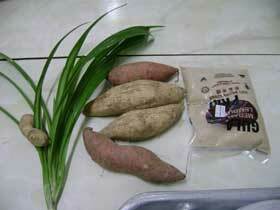 For variety, the cook will choose the sweet potatoes in different colors to make it look more interesting. Here we use the yellow and orange potatoes. The purple ones though, are not suitable to be made into this dessert. Some tips to remember when making sweet potato in ginger syrup is, after peeling the potatoes, soak them in salted water to prevent them from getting oxidized and turned into unsightly dark color. It can be served warm or cold. It is also the basis for bubur cha-cha, which is similar but it has coconut milk in it and some jelly. The use of pandanus and ginger gives a very warm and inviting smell when they are simmered in the pot. You should try to make if you spot some good sweet potatoes in the market. Choose good potatoes, avoid those which are old and cracked. Try to get healthy looking ones and feel firm when pressed. I am fortunate to learn this first hand from Nyonya Belinda Neoh. 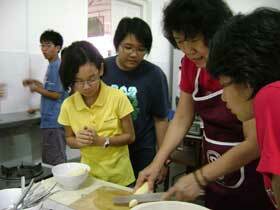 She is a former teacher and is very good at teaching the children the basic cooking skills. Some of these kids had never even touched a kitchen knife before. Cooking skills are always good to learn for everyone, young or old. Here are some pictures of the cooking class taught by the Nyonya Belinda Neo, besides learning how to cook, the kids also learned the basic history of Baba and Nyonya. After all, the origin of our food is part of our heritage that we should be proud of. Peel the potatoes, cut into wedges and soak in salted water.